If you’re interested in buying a wristwatch, you’ll discover that the vast majority of them have one thing in common – a stainless steel case. They might have different movements, diamonds, complications, or bracelets made of plastic or precious metals. But 90% of all the watches made today likely have stainless steel cases. 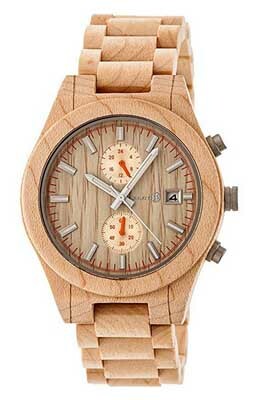 Earth Wood watches are different, and it’s that difference that makes them distinctive. The company’s watches are made from…wood….from the Earth. These watches were created to provide something that was both different and environmentally friendly to the buyer, and they’ve succeeded in creating an attractive, affordable timepiece that looks good and looks unlike most any watch you’ve ever seen. Read on for the full Earth Wood watches review. 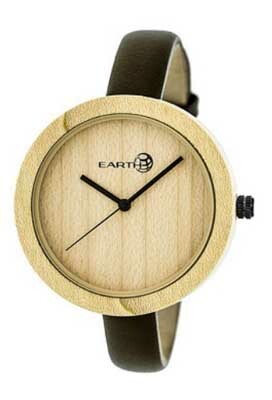 The name brand name is actually “Earth” and “wood watches” is a descriptor, but you’re most likely to find them when searching for the full phrase Earth Wood watches, so that’s how we’ll refer to them. It’s hard to assess build quality in the traditional way when discussing the brand, as they’re different from most other timepieces. No one is going to argue that rosewood or bamboo, the two woods most commonly used are as rugged or as durable as stainless steel, platinum, or high-tech ceramic materials. They’re not. You’re also not going to find ultra-deep water resistance here; after all, they’re made from wood. Most of their models are rated as “splash resistant,” though we’ve seen a couple of models in their product line that were rated at 30 meters of water resistance. You’re not likely to go swimming or diving with a wooden watch, anyway. The watch face is protected by mineral crystal, and the bracelets are, like the watch cases themselves, fashioned from wood, and likely bamboo or rosewood. Taking all of that into consideration, these watches are reasonably well built. Most models have quartz electronic movements, though a few of the more expensive models have automatic (self-winding) mechanical movements. As far as we know, all of these movements are sourced from Japan. Quartz movements are highly reliable and accurate, and have the added benefit of not requiring much in the way of maintenance. You won’t find much technical innovation here, as they’re using off-the-shelf movements sourced from major movement providers in Japan. Most of their models are time-only, though we have seen a few models with a date complication, a couple of chronographs, and several skeleton models that allow you to see the inner workings of the watch movement through the watch face. The styling is what makes them unique, as they all have wood cases, fashioned mostly from rosewood or bamboo. Many of them also feature wooden bracelets, though a few models have leather straps. Models are available in both men’s and women’s models, and part of what makes them unique is the fact that the grain of the wood used is going to vary from one watch to the next, so no two watches are going to look exactly alike. Colors are obviously going to favor brown, as that’s the color of the wood used to make them, but there are a few models with brightly colored faces. You’ll also see a few models with cases in non-round shapes. 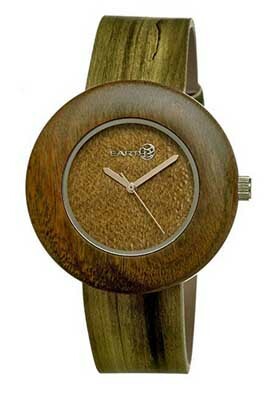 In fact, the styling of Earth Wood watches is a lot more diverse than you might expect, with square, octagonal, and other shapes thrown into the mix. Care and maintenance is fairly straightforward, as most of the models are powered by quartz movements. These will require that you replace the battery every few years. Aside from this, you’ll want to store your watch away from extremes of temperature and moisture, as these can damage the movement or the case. You also need to take care adjusting the bracelet if you have a model with a wooden bracelet, as the links can be easily broken. There are detailed instructions for this on the company’s Website, but if you’re unsure, you may wish to have a jeweler adjust the bracelet for you. 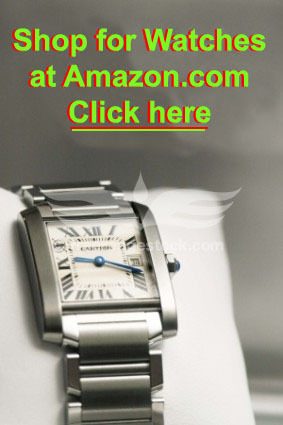 These watches come with an odd warranty that isn’t explained all that well on their Website. It appears that some components of their watches are covered by a one year warranty and others by a two year warranty. If in doubt, you should contact the company to ask any specific questions you might have. Despite the custom nature of the wooden cases used in these watches, their pricing is quite reasonable, as designer watches go. Prices range from a low of about $60 to a high of about $400. Prices will vary from one retailer to another, especially if shopping online. While the brand may be available at a few brick and mortar retailers, we aren’t aware of any that carry the brand. You can buy them at a number of online retailers, and they’ll give you your best opportunity to buy discount Earth Wood watches. The product line features nearly 50 different models, so don’t be surprised if any specific retailer doesn’t have everything in stock. Most sellers should have a good representative sample. If you’re looking for something different in the way of wristwatches, this brand might be a good choice. Their wooden cases are attractive and different, and the Japanese-made movements offer reliable timekeeping that won’t require a lot of maintenance. Models are available in dozens of styles for men and women and they’re available at prices starting at under $100. If you’re looking for an affordable, attractive watch that will look different from what everyone else is wearing, Earth Wood watches might make a good choice.